Dr. James C. Ha currently serves as Research Professor Emeritus in the Department of Psychology at the University of Washington. He received his Ph.D. in Zoology and Behavioral Ecology specifically from Colorado State University. Dr. Ha has over 30 years of experience in teaching, research, and consulting in animal behavior. He is the lead author on numerous scientific publications on animal behavior, specifically dog behavior. Dr. Ha’s current research interests revolve around applied animal behavior: dogs, cats, and non-human primates, and welfare, enrichment, and behavior modification methods. This work overlaps with his primary research interests which have, for many years, focused on complex social behavior in highly cognitive animals (primates, corvids, and cetaceans). Tracy L. Campion is the co-publisher of Pet Connection Magazine. She earned her undergraduate degree at the University of Washington and later received her M.S. in Primate Behavior from Central Washington University and her Postgraduate Diploma in Journalism from the London School of Journalism. Ms. Campion has also participated in field work exercises including the spatial ecology of Papio ursinus at the University of Cape Town’s Zoology Department. 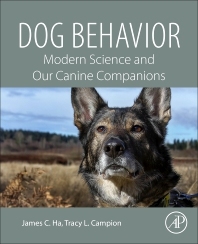 Dr. Ha and Tracy Campion have written a book that is accessible and helpful to the layman and interesting to people working in dog and animal behavior. It is very understandable, well written and has very helpful examples. I highly recommend it. An excellent, up-to-date summary of what is known about canine behavior, based on reliable science. Written in an easily accessible style.